School librarians and educators can download separate documents for each national standards set crosswalked by AASL. Other possible standards sets are being reviewed by AASL for crosswalks and will be posted here as they are completed. A searchable, web-based crosswalk will follow, launching in 2019, allowing users to filter their results for collaborative planning. Plans also include professional learning resources to assist practitioners in developing their own local crosswalks as needed to supplement the national crosswalks created by the association. The AASL Standards Crosswalk Task Force recognizes that sets of standards vary in their nature and level of specificity or generality. When cross-walking standards sets, it is prudent and necessary to leave some interpretation open to the professional educator. Depending on the language used, not all sets of national standards are aligned equally to AASL’s learner, school librarian, and school library frameworks. 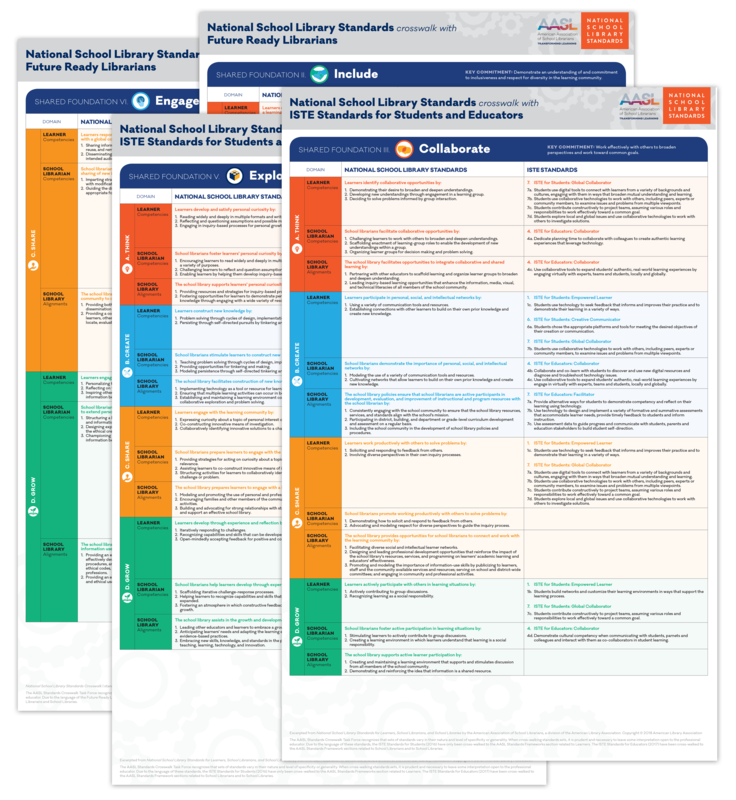 Hang this double-sided poster in your collaborative spaces, classrooms, office, or anywhere you and your partners or stakeholders reference the AASL Standards.